If you are reading this via email or RSS, please click through to the site to see the video of me preparing this meal. There seems to be a heat wave going on everywhere right now. When I talk to my parents in Boston, my boyfriend's parents in Toronto, or relatives in Europe the topic of conversation is always the heat! Well, normally I'd complain about not having a grill but right now I'm quite content grilling inside on my little grill pan with lovely cool central air conditioning! I've been using my grill pan a bit more recently and the perfect occasion to break it out today is for my submission to the Carnival of the Grill hosted by Adam of Men in Aprons. I love the idea of this – I only wish there was a way to taste everyone's creations too! Since it's so hot these days I wanted to grill something light and summery. One dish that has proven to be a winner combines one of my all-time favorite ingredients: pesto. I love the intense flavors of a freshly made basil pesto and I make it fairly often as it pairs wonderfully with so many things. 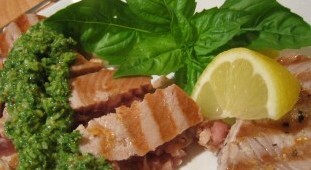 When I saw Giada De Laurentiis on Everyday Italian make beautiful grilled tuna steaks served with pesto I was inspired. I've made this dish several times now and not only is it delicious but it's super easy to make as well. I make pesto and then grill the tuna for a few minutes on each side so that it's seared on both sides but still rare in the middle. This is a fantastic summer dinner. 1) Heat a grill pan over medium to high heat. You want the pan to be sizzling hot when the tuna is placed in the pan – to test it I sometimes just flick a little water on the pan and if you hear an immediate sizzle then it's ready. 2) Wash the tuna steaks and pat them dry with a paper towl. Drizzle with just a touch of olive oil and sprinkle each side with salt and pepper. 3) Add the tuna to the grill pan and leave it for about 2 minutes. Flip the steaks and grill for another 1-2 minutes. Remove from heat and you can either serve the tuna steaks as is or serve them sliced. To cut the tuna make sure to slice it tuna against the grain meaning against the lines of the fish. Serve with pesto. 1) In a small dry pan toast the pine nuts over medium heat. Keep an eye on them and shuffle the pan from time to time so that they get a nice even golden color. The pine nuts will toast very quickly, when they are golden on most sides remove from heat and allow to cool. 2) In a food processor (you can also use a blender, just be sure to scrape down the sides frequently with a spatula so that everything gets incorporated) add the basil, garlic, lemon juice, salt, toasted pine nuts, and start to pulse it. Slowly add the olive oil through the feed tube as the blender is running. You'll notice the pesto start to come together and transform from a coarse mass of basil into a smooth sauce. The reason that I give a range for the amount of olive oil is so that you can control for the consistency that you prefer. For a more coarse thick pesto use less olive oil, for a smoother thinner sauce add a little more. Over time you won't even need to measure as you'll develop an eye for your desired consistency. Also, I usually wait to add the parmesan cheese until after I've blended the other ingredients – I learned this from Giada and I find that by not mixing the parmesan in the blender you get the added texture of the cheese in addition to flavor. A very important part of the pesto-making process is to taste as you go along and adjust the flavors to your liking. Keep in mind though that the parmesan cheese is very salty so wait until after you've added the cheese to adjust for saltiness. These look gorgeous! For some reason my PC is not cooperating so I’ll be back to see the video … I can only imagine how adorable you look! Wow! That is a great video! Good job. Don’t really want to say a picture is worth a thousand word but a video – many more! G- you’re one hot chef in your strapless white get up, move over Giada, there’s another G in town. I never knew that keeping olive oil on what you’re grilling, instead of on the pan, will exude less smoke- GREAT tip for my NY apartment Shopping list is a great idea! Kareem- Shout out for the nice videography job, I like the close up of G’s face when she’s tasting, it’s VERY “Everyday Italian”. Nice work team geneve and kareem! Good tip on reducing smoke while grilling… I didn’t know this and I set off the smoke alarm regularly. Excellent video and recipe.